This is the third in a three-part series written about vaqueo horsemanship. Vaquero Horsemanship Part 1 is the first one in the series followed by Vaquero Horsemanship Part 2. For the last few weeks I’ve described the history and gear of the vaquero in my own words and from my own experiences. This week will be the final topic; the vaquero’s headgear. Last time we talked about the snaffle and hackamore, this time the two-rein and bridle will be the objects of discussion. 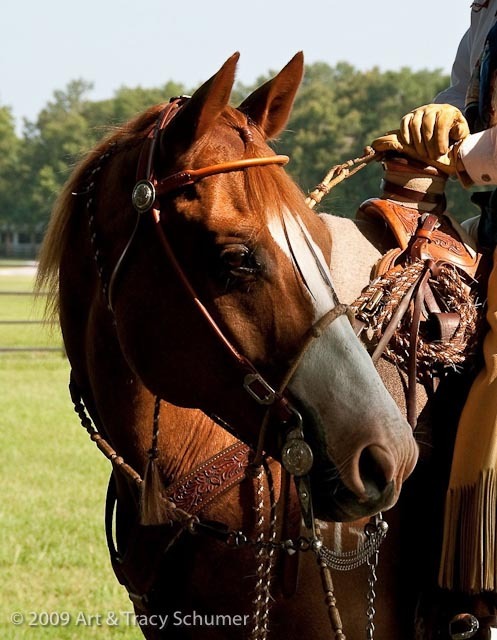 Once you have your horse in the hackamore and he’s doing very well in it, you’re ready for the “two-rein.” The two-rein uses the ideas of a bosal and a curb bit put into one training stage; this helps the horse make the transition from the hackamore to the “straight up in the bridle” stage. If you remember from our previous discussions, the bosal puts indirect pressure on the horse’s nose when you turn him. The two-rein reinforces that idea by using a small bosal about 3/8 inch in diameter with a mecate tied to it for reins. On top of that is a curb-type bit with split leather reins or braided rawhide reins. When you start riding a horse in the two-rein, you use only the bosal reins; this lets the horse get used to the bit just being in his mouth. You continue this until the horse learns to pack the bit comfortably and with ease. This could take a few months depending on the horse. When this point comes, you can start picking up the bridle reins so that it’s 50% use of both. Eventually you’ll drop the bosal reins and use 100 % of the bridle reins; using the mecate reins only for getting the horse through a scary spot or something he doesn’t understand. Once you’re through this point, you can take off the bosal and mecate and you have a full bridle horse. This involves having a 1/4 inch bosalita under the bit for use of a 16 ft horsehair rope as a lead line but not as reins. The mark of a bridle horse is using feet, leg and body energy for direction and the reins as little as possible. Your hands holding the reins should not move over 10" from either side of the horse’s neck; this keeps your horse soft in the mouth. This is what you want to achieve and keep for the rest of your life in working with horses. All good vaquero horses were taken through this training process to become full, straight up in the bridle, spade bit horses and keep a velvet soft mouth. This is what I’m working towards in my own horses and hope to achieve some day. I have enjoyed this little series immensely, I hope you did as well. Comments for "Vaquero Horsemanship Part 3"
The day I saw Tom & Trina Curtin at my first Ray Hunt Horsemanship Clinic was the day I decided that I WILL be a vaquero horseman. I’ve never seen anything so beautiful. Today, I’ve gone as far as turning two nice youngsters into fine 5/8" hackamore horses, and the journey continues. You mention using a curb bit when going into the 2 rein. That is not traditional, a curb bit is not a signal bit. A signal bit is to be used.